Make a Scrapbook or Memory Book: One of the hardest things about moving for a child is leaving everything behind. Create a memory book of your child’s friends, family, house, and favorite places so he or she has something to look at through the transition. Read Books About Moving: Reading books about moving will help your child have a better understanding about what is happening. It also helps you to talk to your child and ask him or her questions about his or her feelings about the move. Packing Toys: If you are downsizing or moving far away, you may have to sell or donate some of your child’s toys or belongings. Give your child the power to decide what to keep and what to give away. If your child is struggling to part with things, tell him or her to pick five things to keep and one thing to give away until all or his or her toys are packed. Pick Out New Decorations: Let your children pick out new decorations and bedding for his or her room so he or she will be excited and feel comfortable about his or her new space. Comfort Item: Have your child pick one item like a stuff animal or blanket that he or she can have with him or her throughout the move. This can help ease your child’s nervousness especially if you are moving far away and have to travel. Involved in the Move: On moving day, have jobs that your child can help with like carrying the pillows or couch cushions from the moving truck into the house. Also, have toys and his or her new bedroom decorations set aside so your child’s room can be set up right away. Go on a Scavenger Hunt: Explore the new town or city that you are moving to and go on a scavenger hunt to find places like the library, school, and police station. Write Letters or Skype: To help with the transition, have your child write letters or Skype with his or her family or friends. He or she can tell all of their loved ones about the move and their new house. 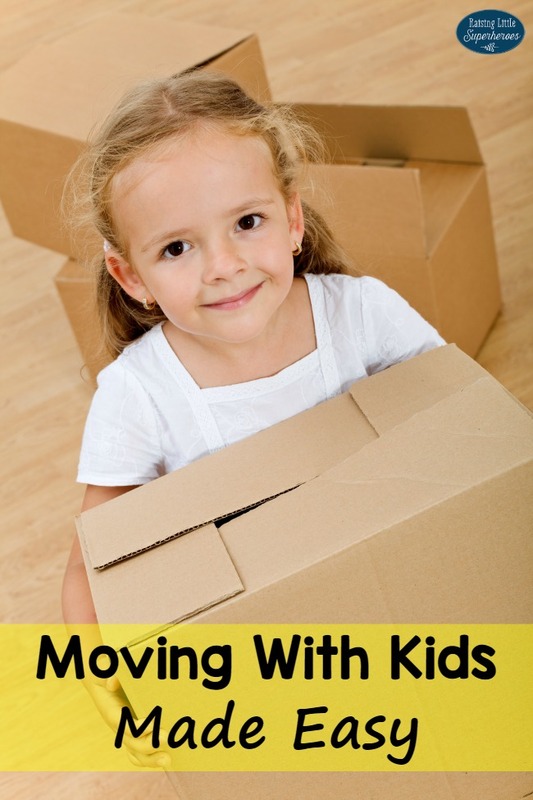 Moving can be a difficult experience for children. They have to leave their house and everything that is familiar to them. Children may also have to change schools, leave their friends, and move a from loved ones. As a parent, there are many things that you can do to help your children cope with the transition and make moving with kids easy. These are great tips. I think it is important to have children as involved in the move as they can, as it may make them feel a little more excited about it and less scared or anxious. Thanks for sharing!